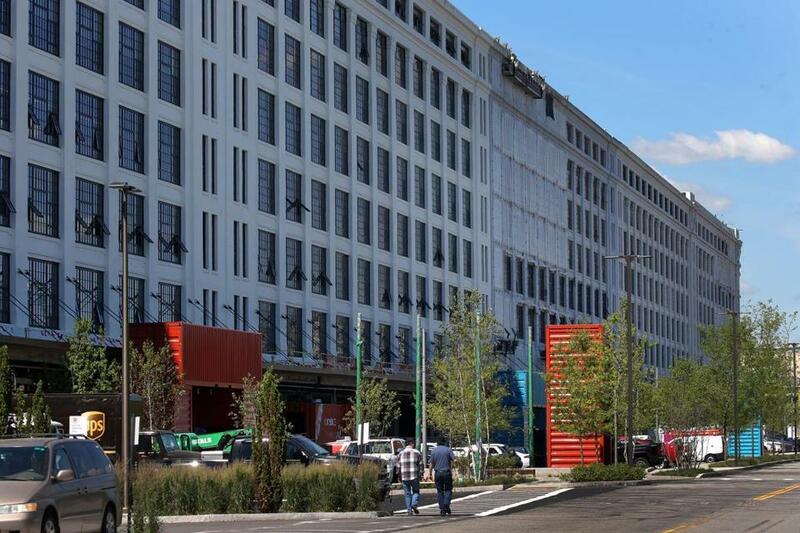 Flextronics International Ltd. said it will open a 17,000-square-foot innovation center in this former military storehouse in the Seaport, now called the Innovation and Design Building. State and city officials are providing more than $3 million in public aid to entice high-tech manufacturer Flextronics International Ltd. to open an innovation center on the South Boston waterfront. The company has agreed to bring as many as 25 new jobs to staff the roughly 17,000-square-foot facility on Drydock Avenue, to be called the Flex Boston Innovation Center, according to documents obtained from the Baker administration through a public records request. In exchange, Flextronics will benefit from a $3 million state grant that will help pay for renovations to its new space, according to the documents. The building is owned by the Boston Redevelopment Authority but managed by the real estate firm Jamestown. Boston officials said they have also offered Flextronics a reduction in payments in lieu of taxes valued at about $300,000 over five years. Flextronics is a massive player in the tech industry, with $24 billion in revenue in its last fiscal year. The Singapore company’s US operations are based in San Jose, Calif. But spokeswoman Renee Brotherton said Flex, as it’s known in the United States, wants a presence in major innovation hubs such as Boston. The innovation center on Drydock Avenue, Brotherton said, will feature state-of-the-art manufacturing equipment that will be accessible to local universities, startups, and more established companies in industries such as robotics, consumer electronics, medical technology, and energy. State and city officials said they have aggressively pursued Flex for two years, and that the company was also considering other cities such as Atlanta and Toronto for an innovation hub to serve the East Coast. Jay Ash, Massachusetts’ economic development secretary, said the benefits of the Flex investment go well beyond the number of full-time hires the company will bring. He said the Flex center will provide equipment and know-how for startups to build small batches of electronic products to sell to customers, without needing to commit to a large-scale manufacturing run. As a result, executives with startups from outside the area will likely stay at local hotels when developing product prototypes at the Flex center, Ash said, and he also hopes startups may relocate or expand in the state to be close to the center. 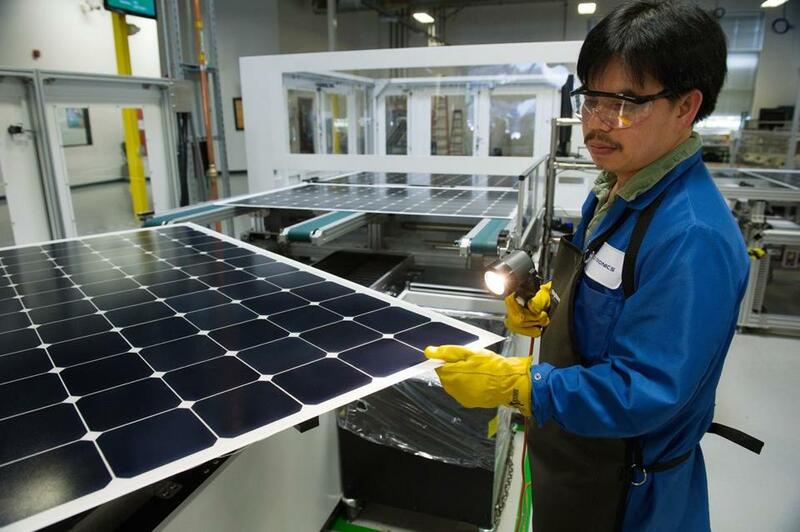 A worker checked solar panels at a Flextronics facility in Milpitas, Calif.
Flex also plans to host mentorship events for startups, as well as business-plan competitions. Contest winners will get help developing prototypes by being given free access to the new South Boston facility and its staff. The company also plans to work with local universities and venture capital firms, hosting “tech-talk series,” for example, to discuss advancements in technologies such as digital health and robotics, according to the documents. The $3 million grant will come from the MassWorks infrastructure program, which state officials are also tapping to provide as much as $120 million to help General Electric build its future headquarters in nearby Fort Point. Construction on the Flex space is expected to begin later this summer, with a goal of completing it sometime in the fall. Flex is expected to move in by the end of the year. 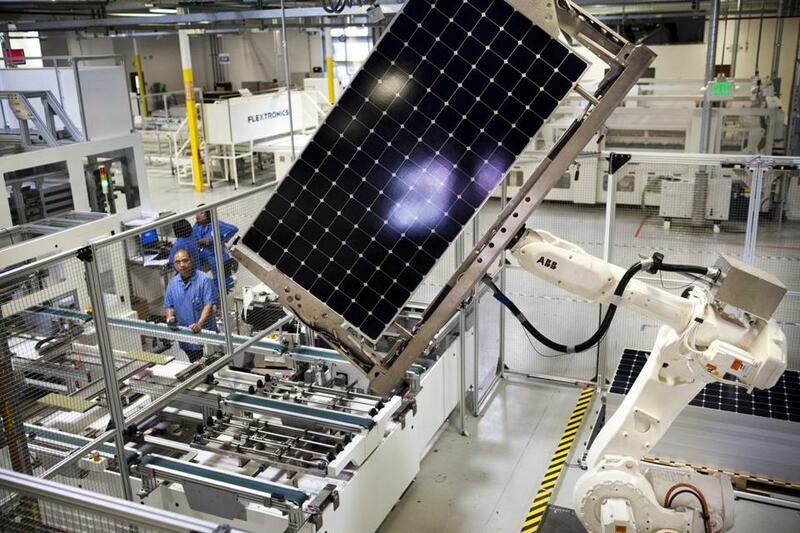 Emily Reichert, head of Greentown Labs, said she hopes to strike a deal with Flex for the clean-energy startups at her Somerville incubator to use Flex’s machinery and to consult with its manufacturing experts. Flex is expected to open the innovation center by the end of the year.